"...The play by Jen Silverman, directed by Beth Wolf, is outstanding. Wolf has taken many important lessons from the production and hopes that the audience will do the same. One lesson being that you should “have the courage to burn it all down and start over, if the need ever arises”. Ellen Phelps, who plays Sharon in the production, and Laurie Carter Rose, who plays Robyn have been able to convey the lessons Wolf and Silverman have perfectly embedded in the production." "...Let me tell you! To my surprise and my delight, Citadel’s Beth Wolf brought this wonderful story to the much more intimate space they occupy with two very talented women to bring these characters to life. I loved what they did. First of all, the set (Eric Luchen) looked far more expensive than one would expect in this venue. although of late, it seems Citadel’s sets are more creative than some of the larger theater’s in the area. Bravo! " "...This is a refreshing and eye-opening new play that sheds light on the lives of two diverse, middle-aged women. Jen Silverman's one-act, while formatted like a sitcom, offers an entertaining, often whimsical journey of self discovery for two fascinating characters. Beth Wolf's production is further enhanced by a beautifully detailed scenic design that provides a realistic background upon which these characters can tell their story. The performances by both Ellen Phelps and Laurie Carter Rose are especially strong, spicy and honest, reminding us that we all need to give ourselves permission to start over every so often." 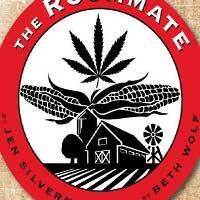 "...Perceptively directed by Beth Wolf and staged on a believable, well-designed set by Eric Luchen, “The Roommate” offers a somewhat exaggerated but fun and interesting “what if” scenario on life when people reach middle age and wonder what should come next." "...Director Beth Wolf's vision helps bring out the tragedy in all of us as we try to rediscover who we are. Sharon's cry of agony as she realizes she must find herself now that she is alone after decades of only understanding herself through labels like "mother" and "wife" - labels that Robin so often talks about in disgust- strike a chord. Maybe it's because I saw my own mother, also named Sharon, in this show as the character sighs, "I don't know where to start...except over again." Or maybe it was because I saw a bit of myself as I struggle to figure out who I am among a series of my own set of labels. In any case, I once again found myself moved by a Citadel Theatre production. The Roommate is for all of us who want to know who were are, even if that means starting over...again."